Do YOU think you have Samhainophobia? Scene: Moments after being fooled into his annual place-kick attempt by Lucy, a depressed Charlie Brown shuffles over to Lucy’s psychiatric help booth. After paying his co-pay, the dialog ensues. Lucy: Well, now, what seems to be the trouble? Charlie Brown: I feel depressed. Every year it’s the same. It’s Halloween again, and I always get a bag full of rocks, I get made fun of and made a model for a pumpkin carving, I never get to share the fun with my best friend Linus because he’s always freezing out in the pumpkin patch, and I always worry about my baby sister, who misses all the fun. Lucy: Well, the very fact that you realize you are feeling this way indicates you are not too far gone. We need to pinpoint your fears. Maybe you have wiccaphobia. This is fear of witches. Charlie Brown: I don’t think that’s quite it. Lucy: Or maybe you have phasmophobia, which is fear of ghosts. Charlie Brown: Well, sort of, but I’m not sure. Lucy: Or perhaps you have coimetrophobia. This is the fear of cemeteries. 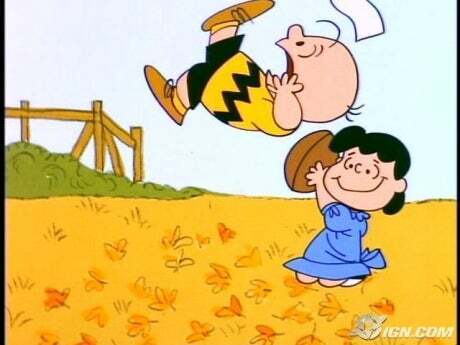 Charlie Brown: No, that’s not it. Lucy: Or maybe you have Samhainophobia. Do you think you have Samhainophobia? Lucy: The fear of Halloween! Instead of remembering the sacred aspect of Halloween, many Christians prefer to avoid it all together as a glorification of evil, a notion to which I’m kinda sympathetic, but when I start working with this as religious phenomena, I’m accused of trivializing evil rather than recognize the vestiges of anything sacred in it. So I’m trivializing evil here, but the same routine vis-a-vis Christmas leads to trivializing the sacred, and usually by the same crowd of critics. The most frequent response among evangelicals has, historically, been to “domesticate” Halloween by keeping observance of it in the home on the one hand and to limit the activity to more of a celebration of autumn, change of season, and the beginning of harvest. Jack o Lantern’s are welcome, as long as they aren’t too scary looking (or gross, or completely inappropriate…). Churches, and now schools, sponsor costumed Harvest Festivals, complete with bonfires and cookouts, games, and, of course, candy. I love this, because it’s so ironic, because this taming and domestication of Halloween (especially by Christians and churches concerned with the “playing with evil” and the emphasis on death, the grotesque, the monstrous, and the demonic) is a return to the origins of Halloween in the Celtic festival of Samhain. We don’t know much about Samhain; in fact, we know a lot less than many Halloween fanatics think we know. Certainly it is very old, and likely pre-dates Christianity; at the very least it pre-dates Christian missionary activity to Celtic peoples in Europe (who were not only located in Ireland). What we know comes from much later Irish sagas and legends that were not written until the 9th -12th centuries, many hundreds of years after the arrival of missionaries such as St. Patrick (5th century). By the time they were written, the Church was well-aware of the festival and did everything it could to figure out a way to incorporate it into its own calendar of liturgical feast days, starting with the Feast of All Saints on November 1, then All Souls’ Day on November 2. In Middle English, “All Saints” translated into “All Hallows”, which still means “sanctified” or “holy,” and the evening before became “All Hallow’s Even, or “Hallowe’en,” corresponding exactly with the celebration of ancient Samhain. So much for the church’s efforts there; but what did Samhain entail, and what carryovers are there now in today’s “domestication” of Halloween? Samhain was the first day of the new year in the Celtic calendar and was the first day of winter, marking the end of the farmer’s year. Everything had to be harvested, stored, and eaten, and it was a time for partying and big bonfires. It was also the beginning of the darkest season of the year, and when vegetation dies. In the Irish sagas, everything revolved around Samhain; wars fought, journeys started, and heroes are born. We find in the sagas tales of heros going door-to-door, begging for treats and food on Samhain, an ancestor of our own trick-or-treating tradition. It is also on Samhain that the doors of the underworld are open, just as it they are now for horror flicks at the theatres. In another saga, a race of supernatural creatures demand tribute from the new harvest from humans on Samhain, who leave out food at the entrance to their homes by hanging the harvest on the doors, thresholds, and crossings for their supernatural overlords. What about dear old Jack? Jack was a blacksmith who, the story goes, was too evil to get into heaven but too smart to remain in hell; he tricks the devil into kicking him out of hell, and on his way out the door, grabs a handful of burning coal (or straw, according to various traditions) and puts it into the pumpkin he’s been eating, using this as his lantern as he wanders the world between the world above and the underworld, and on Samhain’s Eve, when all the doors are open, he comes and goes at will. Anyhow. I could go all Bakhtin here and go into the importance of masquerading, transitional spaces, and carnivale and so forth, which is so important as well. I’m happy to do so in the comments, if there are any. But I just wanted to point out that the Samhainophobia that is now part of the Halloween experience has ironically led to a return to Halloween’s pagan origins more than it has “tamed” or even “Christianized” the holiday. So go out and enjoy it tonight! Interesting the history and lore of Halloween… And of course the Charlie Brown specials are classic. I came from a sort of different perspective I guess where I enjoyed Halloween as a kid, knew of it’s connection to All Souls and All Saints days within the Catholic church, but really maintained it as a “kid’s holiday”. Once an adults, I didn’t pay an over amount of attention to it, until now that I have a young son – and this year was good fun as we were Curious George and the Man in the Yellow Hat.